In my last post, I wrote about my research into my newly-discovered Panek ancestry. To briefly recap, the marriage record for my great-great-great-grandparents, Michał Zieliński and Antonina Ciećwierz, stated that Michał was the son of Piotr Zieliński and Marianna Panek. Piotr and Marianna’s marriage record is indexed in Geneteka, and states that Marianna was the daughter of Helena Panek, with no father’s name given. Although this suggests that Helena was an unwed mother, I believe she was actually Helena (née Święcicka) Panek, wife of Tomasz Panek, of Kuznocin in Sochaczew County. The fact that Helena was married to Tomasz Panek at the time of Marianna’s birth does not necessarily mean that Tomasz was Marianna’s father, however, so the question remains as to whether he was named on Marianna’s marriage record and merely omitted from the index, or whether the marriage record itself states that Marianna’s father is unknown. Of course, the actual marriage record is needed here and may shed some light on the situation, and I have requested a copy from the diocesan archive in Łowicz. However, since I requested a large number of records, and since the archive is closed from now until the end of July, it might take some time before I have Marianna’s marriage record in my eager little hands. Since patience is not always my virtue, I turned to DNA to see if there was evidence to prove or disprove my hypothesis that Marianna Panek was the daughter of Tomasz Panek and Helena Święcicka. Considering the distant time frame of the research problem, it’s better to analyze my mother’s DNA match list rather than my own, since she is one generation closer to these elusive Panek/Święcicki ancestors than I am. I searched her matches at Ancestry for the surname Panek, and came up with 3 distant cousins with this surname in their family trees. Of these matches, two had family trees which were locked, and one had a public tree. I could request access to the locked trees, but I have no reason to suspect anything earth-shattering there, because the matches are only 10 centimorgans (cM, a unit of genetic distance) across 2 segments, and 7 cM across 1 segment, respectively. Such small segments suggest a very distant match at best, or perhaps even a matching segment that is identical by chance (a false positive). The public family tree of the third Panek match revealed that his Panek family was from Oblekon, Świętokrzyszkie province, which isn’t especially close to Sochaczew, where my Panek family lived. Panek is not an uncommon surname, and moreover, that match, too, was only about 10 cM, so it won’t be an easy task to identify our common ancestors. The fact that Mom doesn’t yet have any strong matches to Panek cousins does not in itself offer evidence regarding the question of whether Tomasz Panek was Marianna’s father. It’s entirely possible that Tomasz Panek could have been Marianna’s father, but that Mom simply did not inherit the right bit of DNA to match another of Tomasz Panek’s descendants. It’s also entirely possible that a match will show up some day as more people test. At the moment, the vast majority of Mom’s 117 DNA matches at the level of 4th cousins or closer, appear to be people living in North America who have traced their ancestry back to Poland, rather than Poles living in Poland today. DNA testing is still unaffordable for many Poles, and Ancestry DNA is not well known in Poland, so there are very few Poles in their database. As DNA testing becomes more affordable, hopefully the situation will improve and more Poles will become interested in testing with Ancestry, increasing the likelihood that I’ll find cousins from Poland in my match list. However, at this point, the search for cousins from the Panek family didn’t pan out, so it was time to try a different angle. I searched Mom’s matches for the surname Święcicki with much more promising results. A fourth-cousin match immediately popped up to “D.K.,” as well as one 5th-8th cousin match to “J.G.” Both of them have public trees, and based on these trees, D.K. and J.G. are related to each other as well as to Mom. Note that diacritics matter when searching DNA matches in Ancestry, as a search for “Święcicki” will produce different results than a search for “Swiecicki.” If you try to get around this problem by checking the box to include similar surnames, all hell breaks loose. In the case of this search, Mom’s list suddenly jumped from two matches to 68 matches, many of whom had surnames that weren’t remotely close to Święcicki/Swiecicki. Rather than wading through all these matches, I chose to focus on just the first two Święcicki matches see if I could determine how we might be related. Both J.G. and D.K. trace their ancestry back to the Gontarek families of Minnesota. Their family trees document several siblings — Michał, Wiktoria, Ludwik, Rozalia, Bronisława, and Lena — who emigrated from Russian Poland to locations in Steele, Le Sueur, and Waseca Counties, west and south of the Minneapolis/St. Paul area. The fact that they settled in the Minneapolis/St. Paul area was immediately interesting to me, since previous research led to me discover that this area was the destination for other ancestral cousins from Sochaczew County. Although the family trees are well-documented through census records, it’s not immediately clear what evidence they have for the names of the parents of these siblings, since the trees are a little light on vital records. Nonetheless, both family trees report that these immigrants were all children of Stanisław Gontarek and Marianna Święcicka. Furthermore, J.G.’s tree states that Marianna Święcicka was the daughter of Piotr Świecicki and Anna, maiden name unknown, and that she died in Kuznocin on 9 December 1890, and in her gallery, I found a note indicating that she hired a professional genealogist in Poland to find this information. By this point I was sitting on the edge of my chair. Kuznocin was exactly where my Święcicki ancestors were from, so this could not possibly be a mere coincidence. A quick search in Geneteka revealed the births of most of these siblings in Sochaczew and nearby parishes, including Młodzieszyn, where the most recent generations of my Polish family lived (Figure 1). Figure 1: Geneteka search results for births of children born to couples with surnames “Gontarek” and “Sw,*” searching as a pair in Sochaczew and indexed parishes within a 15-kilometer radius. In translation from Russian, the record states that Bronisława was born in Młodzieszyn on 3 August 1885 at noon. Her father was described as Stanisław Gontarek, a laborer residing in the village of Młodzieszyn, age 59. The text pertaining to her mother, underlined in red, states that the child Bronisława was born “….of his [Stanisław’s] lawful wife, Marianna née Swięcicka, age forty-eight.” Marianna’s age suggests that she was born circa 1837, and if that was the case, then she would have been about 21 at the time of Julianna Gontarek’s birth. This is quite reasonable, and consistent with the hypothesis that all the children found in our Geneteka search belong to the same couple. Since Marianna was reported to be age 56 when she died in 1890, she was probably born circa 1834. Lo, and behold, there are two matching birth records in Geneteka for Marianna Święcicka or Swięcicka in 1835, recorded in Sochaczew which is the correct parish for the village of Kuznocin (Figure 4). Figure 4: Search result for birth of Marianna Swiecicka, born between 1830 and 1840 in Sochaczew parish. The two records shown here are the civil record and the church record. It’s possible to tell which is which because the “i” infodot in the “Remarks” column indicates that the second record was taken from the Latin church book, so the first record must be the Polish-language civil transcript. Both versions are only available from the diocesan archive in Łowicz, so it looks like I’ll be placing another order with them. Marianna’s mother’s maiden name is recorded as Janiak, which is new information for me, and presumably for my DNA matches as well. Another search in Geneteka quickly produced Piotr and Anna’s marriage records — and revealed how I am related to D.K. and J.G. (Figure 5). Figure 5: Geneteka search result for marriage of Piotr Swięcicki and Anna Janiak. Piotr was the son of Stanisław and Urszula Święcicki, my putative 6x-great-grandparents! I say “putative,” because at this point I still don’t have a single shred of direct documentary evidence that I have any ancestors with the Swięcicki/Święcicki surname. I only have a theory based on indirect evidence that my documented ancestor, Helena Panek, was born Helena Swięcicka, daughter of Stanisław and Urszula. Up until this point, one could argue that there might still be an unmarried Helena Panek who was actually my ancestor, but who was not found in the indexes in Geneteka because those indexes are incomplete and don’t cover every year in every parish in the vicinity of Sochaczew. However, the discovery of this DNA evidence certainly adds substantial weight to my theory. Based on the paper trail, both J.G. and D.K. are 5th cousins once removed to my mother, and the amount of DNA shared by my mother with each of them supports this relationship. Due to the random nature of DNA inheritance through recombination, D.K. and my mother share 40 cM of DNA over 2 segments, while J.G. and my mother share only a single segment of 8.6 cM. However, both of these values fall within the normal range of centimorgans shared by people who are 5th cousins once removed. 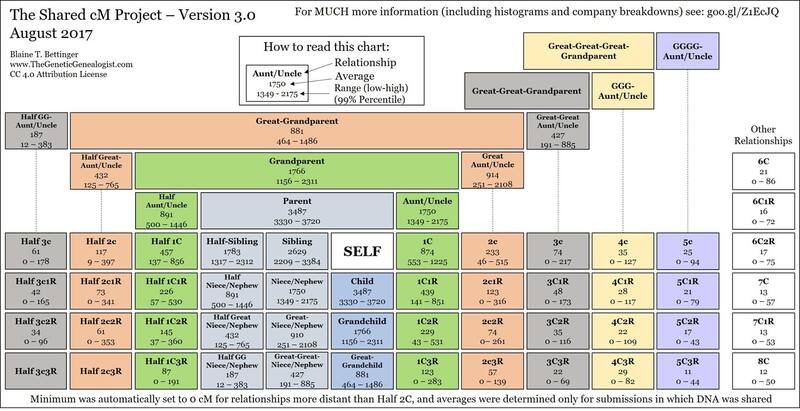 According to Blaine Bettinger’s handy Shared cM Project chart, people who are 5th cousins once removed might share anywhere from 0 to 79 cM of DNA, with an average of 21 cM shared DNA. Of course, the DNA evidence in itself is not “proof” of my descent from Stanisław and Urszula Swięcicki. It’s true that DNA doesn’t lie, but in cases such as this, where DNA evidence is used to confirm a relationship that’s further back than parent-child, DNA evidence is still open to interpretation. The possibility exists that Mom (and I) might be related to D.K. and J.G. through some other set of common ancestors. However, one can invoke the law of parsimony here and conclude that Stanisław and Urszula are, indeed, our common ancestors because that explanation is the simplest, given the substantial body of indirect documentary evidence that’s accumulated. To put it another way, when you hear hoofbeats, expect horses, not zebras. I just love it when the pieces fall into place like this. I just heard back yesterday from both J.G. and D.K., and I’m delighted to have an opportunity to share all this new information with them. And of course, I still can’t say whether Tomasz Panek was Marianna’s father or not, so that remains a mystery for now. Hmmm….. maybe I’ll go and reexamine those DNA matches with the surname Panek in their family trees. This may be my lucky day! 1 “Akta stanu cywilnego parafii rzymskokatolickiej w Młodzieszynie” (Młodzieszyn, Sochaczew, Mazowieckie, Poland), Księga urodzeń 1885-1895, 1885, no. 105, birth record for Bronisława Gontarek, 3 August 1885, accessed as browsable images, Polskie Towarzystwo Genealogiczne, Metryki.genealodzy.pl (http://metryki.genealodzy.pl : 20 July 2018). 2“Akta stanu cywilnego parafii rzymskokatolickiej w Młodzieszynie” (Młodzieszyn, Sochaczew, Mazowieckie, Poland), Księga zgonów 1889-1901, 1890, no. 79, death record for Marianna Gontarek, 9 December 1890, accessed as browsable images, Polskie Towarzystwo Genealogiczne, Metryki.genealodzy.pl (http://metryki.genealodzy.pl : 20 July 2018).